The 41 high school students at UrbanPromise Academy are trying the change that. Before the minuscule, nondenominational Christian school adopted the park last autumn, dirt and weeds as well as the occasional hypodermic needle or beer bottle covered nearly all the gravestones at the park. 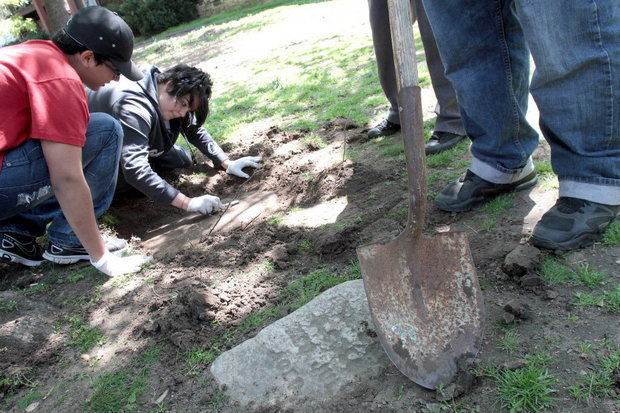 Now, 15 grave markers, all of them dating back to the 1890s, have been exposed, including four unearthed for the first time on Friday by a group that included nine UrbanPromise students as part of a senior service project. Joining the 41 UrbanPromise Academy students were 27 seniors from Clearview Regional High School in rural Harrison Township, Gloucester County. While some raked leaves and cleared litter, others searched for buried gravestones by gently striking the ground with picks and listening for the sound of metal on stone. Johnson Park is Camden’s first African American cemetery, and is the final resting place of hundreds of soldiers, as well as the city’s first black police officer. “We require all of our students to do community service, and each class does a group service project, so when we heard about the story of Johnson Park, it just seemed like an obvious connection for us,” said Kevin Watkins, a history teacher at UrbanPromise Academy. “We watched a documentary about it made by a local attorney named Kevin Walker, with historian Sam Asbell, and they learned all about it. Many of the headstones are illegible, but those that can be clearly read mark the graves of Civil War veterans who died in the last decades of the 19th century. Joining him are Milton Dix, who served on the USS Princeton and died on March 10, 1891; John W. Hamilton, born in Essex County, Va., who died on Oct. 18, 1896; and several others. Alexandra Gonzalez was one of the seniors who cleared the dirt off the stones with a toothbrush. The students have only inspected a small fraction of the park. Joseph Palma, another senior who worked on the project, said the memorial likely holds approximately 110 graves. "I already knew it was a cemetery," said the Camden native. "I just didn't know it was important. "I feel a certain connection to the soldiers here — from the Civil War, to the Spanish-American War, World War I and II, and the women who served, too." 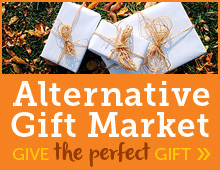 The park is only a few blocks away from two liquor stores. Palma said the site over the years had been neglected and became littered with trash, including empty cans as well as marijuana bags. 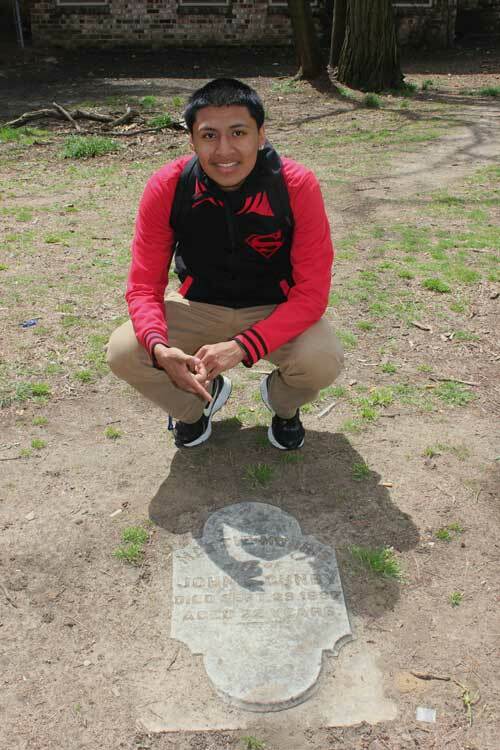 “There was a bronze plaque at the park, but someone stole it,” said Palma. On the other hand, when residents of the apartment complex, located just feet from the graves, saw the students working, they walked outside and asked how they could help. Faith Kroma, vivacious and full of energy, clipped her riding shoes into the toe holds of her aluminum framed Fuji racing bike. Faith was about to do something she’d never done before: ride 15 miles through Camden in preparation for our Pedal for Promise bike race. She and her peers were training for the event’s 65-milecourse—the longest UrbanPromise has ever offered. “I’m used to riding the smooth roads of Medford Lakes, but I’d never really thought about training in our own city,” Faith said. Her wonderment made sense. Camden streets are notoriously narrow and wounded with potholes. Drug dealers promote business on prominent corners—not the ideal place to train for such a long ride. So, as part of their three-month training, Jim, a handful of volunteers, and students on our UrbanPromise Academy “Elite Cycling Team” rode along the back streets of Camden. Our small high school may not have a basketball team, football team, or cheerleading squad. But the Academy is the only school in the city with a cycling team. And it’s open to both males and females of varying athletic prowess. 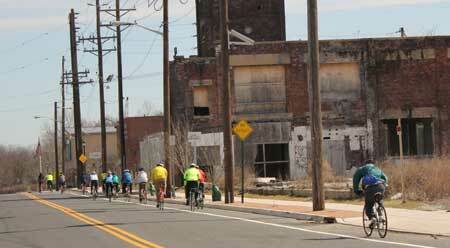 Each spring the teens dust off their bikes, pull out their Spandex shorts and helmets, and begin logging miles. And that’s why we encourage our students to ride. Being part of a team builds community, and accomplishing goals increases self-confidence and teaches discipline. And training for a 65-mile race keeps our young people in shape—and out of trouble. When Faith and Kevin heard I was writing about them, they asked me to tell you that they’re looking for rider sponsors. Sponsorships support experiential and expeditionary learning at UrbanPromise Academy and within our UrbanTrekkers program, and help offset tuition, buy new textbooks, and underwrite extracurricular activities like camping and hiking. So just as I challenge my students to get involved, I’m asking you to pick a rider—or two or three—to support. Sponsor each mile our teens complete or give in full. 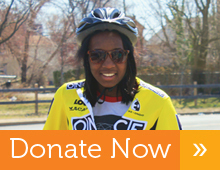 Your sponsorship will encourage our riders deeply and send a message that they matter. 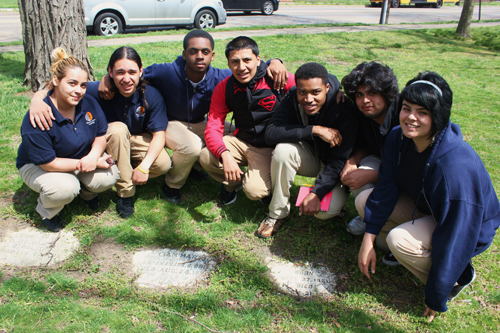 The seven founding members of the Johnson Cemetery Restoration and Maintenance Project in Camden, New Jersey are Adrian Alicea, Maria Arroyo, Carlos Garcia, Alexandra Gonzalez, Kirk Johnson, Joseph Palma, and Tyrone Richardson; they are high school students. Johnson Cemetery is located on Federal Street at Terrace Avenue, only a few hundred feet away from the students’ U.S. Government and Economics class at UrbanPromise Academy High School. Veteran soldiers who fought for the 54th Regiment of the Union Army in the Civil War, as well as veterans from the Spanish-American War were laid to rest in Johnson Cemetery. Still, not one student in the senior class was aware that the very men they were studying in history were buried across the street. The mean income of a resident living within the city of Camden is approximately $26,000 (United States Census Bureau), which is far below livable wage estimates. As a result of insufficient funds and neglect of the grounds, Johnson Cemetery became so unkempt that people forgot that it was sacred ground, a cemetery. Residents began using the grounds as a park, hosting barbecues and playing field games on the cemetery grounds, over the resting places of American heroes. 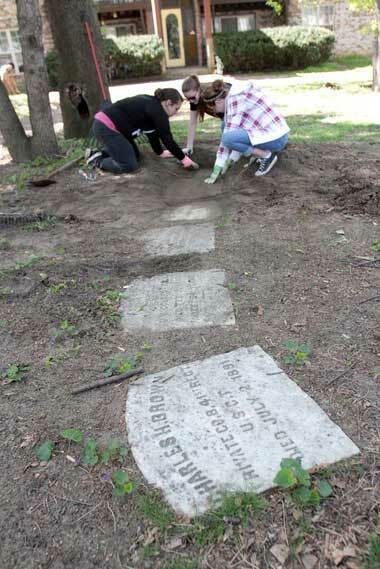 When the senior class learned of the valor and sacrifice of those resting at Johnson Cemetery, they chose to work to restore dignity to these grounds. Both Adrian Alicea and Carlos Garcia felt compelled to act. With the knowledge that the park was and still is a cemetery, they felt it was now their responsibility to reinstate honor to the cemetery. Motivated to make a difference, the students first spent time cleaning the grounds. Once weekly, as a team, the senior class would pick up trash, weed, and rake the grounds. The students took special care and consideration when working around the tombstones. Their immediate task was to clear the tombstones so that they would once again be visible. The students then began spreading awareness throughout the city of Camden. They wanted Camden County residents to know exactly what the patch of ground at Federal and Terrace was and who exactly was buried there. The students also invited other schools and community groups to participate in cleanup and maintenance projects at the cemetery. During these projects, the senior class would speak about the history of the cemetery and explain the importance of maintaining it. After spending weeks working to maintain the grounds at Johnson Cemetery, the senior class petitioned the Camden City Council to make a proclamation stating that the students of UrbanPromise Academy will take the charge of maintaining the grounds of Johnson Cemetery. The senior class then extended an invitation to Frank Moran, Camden City Council President and Director of Camden County Parks, to UrbanPromise Academy in order to discuss the present maintenance and future development of Johnson Cemetery. 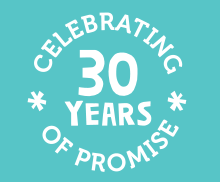 In December of 2012, President Moran guaranteed Camden City and Camden County’s support of the Johnson Cemetery Restoration and Maintenance Project before all students of UrbanPromise Academy. After President Moran visited the Academy the Camden City Council passed an official resolution making the school “Friends of Johnson Memorial Park” on February 12, 2013. In so doing, the City Council honored the service of the UPA seniors while guaranteeing the future maintenance of Johnson Cemetery. UPA History Teacher, Kevin Watkins, who attended the meeting, said, “Specifically he [Councilman Moran] gave UPA stewardship” over the grounds. The senior class’s efforts are one step in revitalizing this city of 77,000 people who deserve to have a place where the strength and endurance of their heroes are honored—a location for legacy. Johnson Memorial Park and Cemetery is becoming one such place.